Organized crime is famously good at exploiting time-sensitive industries like construction, fishing, and—of course—garbage removal. But revelations about millions of tons of toxic waste buried haphazardly and illegally by the mob are causing an uproar in southern Italy, where cancer rates are nearly 50 percent higher than the average in certain areas. It all began in the 1980s, when the Camorra mafia—one of Italy's oldest and largest groups—took control of garbage removal in the southern Italian state of Campania. Further south, in Calabria, another mob organization—the 'Ndrangheta—was getting into the same business. You see, trash is the perfect racket for the mob: It's easy to infiltrate, it's a desperate necessity for every citizen, and it's not terribly hard to do. As Michelle Tsai explained in a post called "Why the Mafia Loves Garbage," this holds true for criminal organizations all over the world, from Taiwan to New Jersey to Italy. In Italy, where as many as one in five businesses is controlled by mafia, the long-term effects of the garbage racket weren't immediately clear, although it caused periodic crises that filled the Naples streets with trash. But over time, further north, the rural Casal di Principe region has become known for the massive amount of garbage strewn across its once-beautiful landscape. Campania is now known as "the Land of Fires," for the garbage fires that regularly ignite. In his 2006 book about Naples' organized crime, Gomorrah: A Personal Journey into the Violent International Empire of Naples' Organized Crime System, Roberto Saviano describes the region as a place where "any space with an owner can become a dump site." Desperate landowners sell off their fields, and the clans acquire new landfill sites at low—very low—costs. Meanwhile, people are constantly dying of tumors. A slow and silent massacre, difficult to monitor since those who want to live as long as possible flee to the hospitals in the north. The lungs fester, the trachea starts to redden, a trip to the hospital for a CAT scan where the black spots betray the presence of a tumor. Ask the ill of Campania where they're from and they'll often reveal the entire path of toxic waste. The rates of cancer in some parishes are 47 percent higher than the national average—and that's how the region acquired its second nickname, after "the Land of Fires": The Triangle of Death. According to The New York Times' new report on the dumping, some 10 million tons of toxic and nuclear waste have been buried here, from as far away as Germany. Garbage is loaded onto a truck by soldiers of the Italian Army in Agnagno, on the outskirts of Naples, Italy. Image: AP Photo/Salvatore Laporta. "We're polluting our own house and our own land," the mobster said. "What are we going to drink?" "You idiot," the boss replied. "We'll drink mineral water." Indeed, in Gomorrah, Saviano explains how humans—even criminal ones—could willfully do so much damage to their own land. "The life of a boss is short," he writes. "To flood an area with toxic waste and circle one's city with poisonous mountain ranges is a problem only for someone with a sense of social responsibility and a long-term concept of power." Italian politicians are now attempting to crack down on the dumping, digging up waste and sending in the Army to gain control of the situation earlier this month. They describe the mob as "the environmental mafia," or eco-mafia, a term that's been used to describe the crisis for nearly a decade. In fact, many of the waste disposal companies involved in the dumping have "green" names, like Ecoverde. Italy is now even using specialty drones to spy on illegal dumping sites. It gets worse. These companies often dumped all over the region—including the coastlines of Somalia. Reports of a guns-for-dumping scheme circulated. A tsunami in 2005 turned up hundreds of barrels along the shore, and the next year, the UN confirmed that the waste included "uranium radioactive waste, lead, cadmium, mercury, industrial, hospital, chemical, leather treatment and other toxic waste." A dumpsite off of the Somali Coast via Greenpeace. Waste containers were shipped away following a path of least resistance and weakest governance, ending up in remote areas of countries such as Equatorial Guinea, Lebanon, Somalia and the Congo. Toxic waste was dumped on Nigerian and Haitian beaches. Along with similar reports from the UN and other watch groups, a picture of this invisible network is starting to emerge: A hidden, ad-hoc economic system that is ubiquitous yet rarely observed or reported. You might feel very far away from this particular crisis, but it turns out that we all might be accessories. Last month, Interpol published a warning about millions of tons of toxic e-waste arriving in Africa and Asia from developed countries, too. "Much is falsely classified as 'used goods' although in reality it is non-functional," said an Interpol spokesperson to The Guardian. "It is often diverted to the black market and disguised as used goods to avoid the costs associated with legitimate recycling." So not only has refuse from Europe's nuclear power plant found a home off the coast of Africa or Italy—the minerals and metals from your last computer, your fridge, or your phone might have, too. 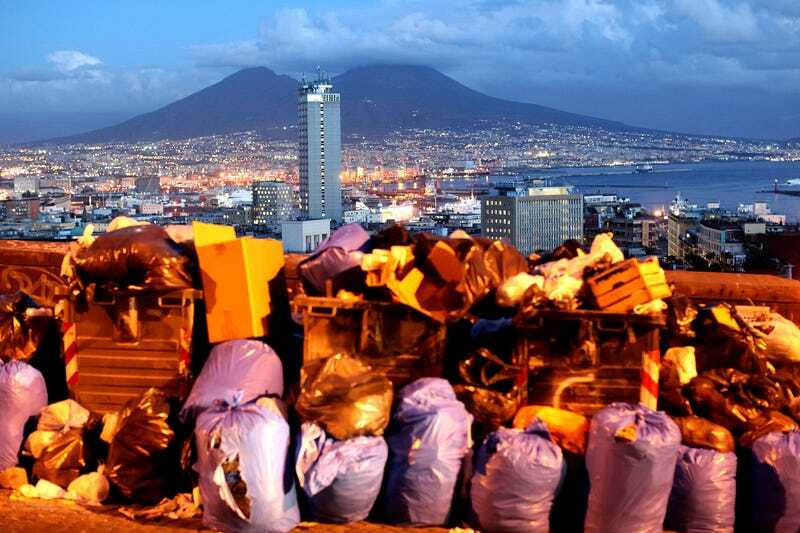 Lead image: Rubbish is piled up in Corso Vittorio Emanuele with Mount Vesuvius in the distance in Naples.